Spring has come early this year, and the fruit trees are abloom in Chianti, adding splashes of pink and white to the hillsides. Beautiful to look at, and a sign things are coming back to life. If you have followed me over the years, you will know that my father was an archaeologist, and that because of that I grew up spending summers in Tuscany, and moved here as soon as I finished college. Dad was of course Not Tuscan; he grew up on a farm in Vermont, and though he left the rural life behind, he never forgot it, and once when we visited my maternal grandparents, who lived in Springfield VT, in March -- I must have been about eight -- he looked out at the snow-covered ground, checked the thermometer, muttered something about the sap running, and called a friend who had stayed on the farm. 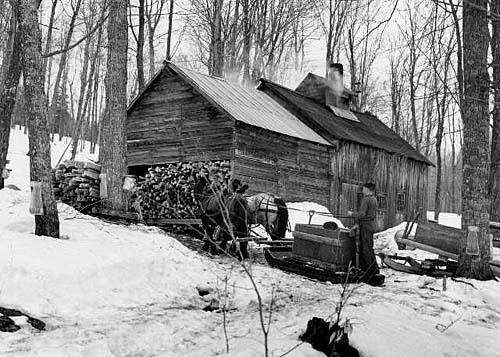 We put on our boots and coats, and were soon driving up a slushy dirt road into the forest, while he explained that sugaring was a seasonal activity, which only took place during the early spring when days were above freezing, while the nights were not, and the sap flowed abundant in the maple trees. 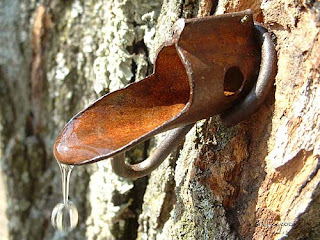 I listened without really understanding, Pennsylvania city boy that I was -- in my experience maple syrup came from a glass bottle, and I had never thought about how it got there -- but things became much clearer when we reached our destination and Dad's friend was in the farm yard, hitching a sledge with a large metal tank to a horse. 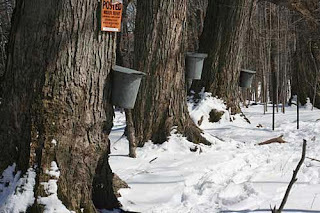 They shook hands while I wondered what was going on, and then we set off into the woods, where all the maples had buckets hanging from taps driven into their trunks. And I found myself wading through the snow to the trees, taking the buckets, removing the lids (and ice if there was any), and pouring the sap, which I tasted, and found to be sweet, into the tank. It was quiet work, the snow muffling our footsteps, and as we wound our way through the grove the horse began to lean into the harness as the level of the sap in the tank rose. 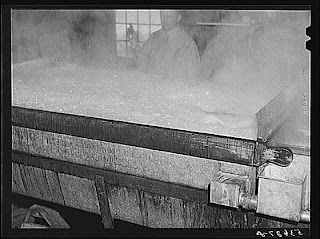 The air had that bluish cast it gets at dusk when it's cloudy and there's snow on the ground by the time we got to the sugaring shed, a weathered wooden building with a slatted cupola that was emitting clouds of steam, and I vaguely remember looking in, seeing the glow of the fire under the evaporator and the bubbling sap. He set the syrup to boil on the stove, and while it was concentrating further filled a baking pan with clean snow. 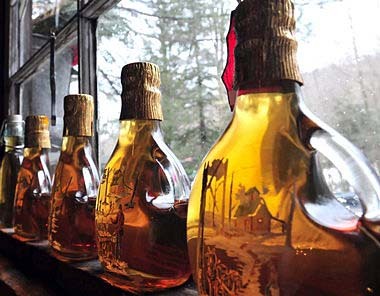 When the syrup was reduced in volume by about 50% he poured it in strips on the snow, where it hardened instantly. Home made maple candy! There's no question that Sangiovese ages well -- Traditional Brunello begins to show well after a decade or more, there are legendary bottles in Chianti Rufina, and it has been my good fortune to taste some extraordinary, and extraordinarily fresh Carmignano wines from the 30s. These are all Tuscan. People tend to think less of ageworthiness in conjunction with the Sangiovese from Romagna, perhaps because the general image of Sangiovese di Romagna is as a lighter quaffing wine. This doesn't mean, however, that Sangiovese di Romagna cannot age well, and indeed in 1970 Mario Pezzi, of the Fattoria Paradiso, decided to try something new: A Sangiovese di Romagna aged in small oak the first wine of its kind in Romagna, and a wine that the late Luigi Veronelli thought was a great idea. So did others -- he was invited to supply it to the Palazzo del Quirinale, Residence of the President of Italy, and it quickly attracted both attention and imitators. His daughter Graziella brought the last bottle to a retrospective of Sangiovese di Romagna organized by Giorgio Melandri on the occasion of the establishment of a Sangiovese di Romagna archive in the cellars under the main square in Bertinoro, a town in the heartland of Sangiovese di Romagna. The retrospective featured 26 bottles, which Giorgio organized into 7 chapters (for want of a better term), each illustrating an aspect of winemaking in Romagna over the past 40 years. Pale almandine with orange rim. The bouquet is elegant, in a thoroughly tertiary key, with dusky accents, alcohol, Moroccan leather, brandied prunes with some brandied raisins too, sweetness from alcohol, and some bramble, cool accents, slight balsam, hints of sherry and also some nougat. A lot going on, and it continues to evolve with great interest. On the palate it's dusky, with warm rather leathery sour cherry fruit with savory accents and some leaf tobacco as well, flowing into a long savory tobacco laced finish. Very nice, and though it is clearly quite old, has a story to tell and is a wine a wine lover will enjoy conversing with. This was the last bottle. Pale almandine with orange rim. The bouquet is deft, though not as bright as the 70, with warm savory notes and sour berry fruit supported by considerable leaf tobacco and some greenish notes with considerable balsamic accents too. Pleasant, in a quite material key. On the palate it's tertiary, with leather and sour cherry fruit supported by deft tannins and some brandied fruit, also savory notes and flows into a long dry greenish tannic finish. It has a lot to say, and is perhaps a little more powerful and interesting on palate than the nose. It's not quite as bright as the 70, and this is in part the vintage, and in part the bottle. Both wines were quite interesting and very much Sangiovese, with the acidity typical of Sangiovese of the period and scrappy tannins holding them up. Deep almandine with some black reflections and almandine rim. Quite deep color, surprisingly so for a Sangiovese of that time. The bouquet is interesting, and a bit odd, with cut flowers and chrysanthemums, with a degree of sweetness as well; it's quite green, with aromas that are more typical of older southern wines -- Negroamaro and Primitivo -- than Sangiovese with some savory notes too. It's interesting. On the palate it's earthy, with savory notes and spice, sour berry fruit and some balsamic notes, with considerable leather as well. Unusual mouthfeel, with some carob and a certain leatheriness, and one again has the impression that there is also something else in the wine in addition to Sangiovese. It is quite possible; winemaking was approximate at the time, and many did flesh out their wines with more powerful southern wines. Pale almandine with almandine rim. The bouquet is fairly rich with carob and leather mingled with some savory notes and balsamic brambly acidity. The palate is quite alive, with bright leathery savory notes supported by tannins that are brambly and leathery, and flow into a clean savory finish. Quite whole yet, and a lot going on with considerable depth and elegance. It's interesting, and though again quite old is graceful in a rather lacy key, and has quite a bit to say. Very impressive, and as is the case with the other 1970s wines shows that there was much more territoriality, taking the acidity the wine had and accepting it, without attempting to soften it or make it more appealing to an "international" taste, and this is part of the reason for its longevity. Pale almandine with almandine rim. The bouquet is, well, the Italian term would be scarico, which means unloaded or empty, with some balsam and slight mentholated accents, some alcohol. Slight dried leaves. And hints leather. On the palate it's bright, with slightly candied fruit supported by fairly bright brambly acidity and some sweetness from alcohol, and tannins that have a brambly burr and flow into a fairly long savory brambly finish with slight sweetish accents. Pleasant, and though some of the other tasters found it more commercial, I found it to display some of the same distance of the others -- perhaps not quite as much, but the distance is there. These are wines of the pre-consulting winemaker era, when the winemakers in the wineries made the wine following tradition using what they had, some wood, all large, and tradition. Consulting winemakers began to arrive in the early 1980s. 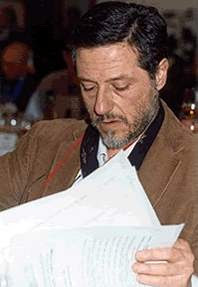 Vittorio Fiore was one of the first and most important, settling in at the Azienda Castelluccio. Ruby with almandine rim; color has held more than the older wines. The bouquet is deft, with savory balsamic accents with warm sea salt and green leather, also Moroccan leather, and some deft mentholated accents with slight underbrush as well. Quite interesting. On the palate it's bright, with fairly rich cherry fruit supported by slight bitter accents, and by moderately intense rather scrappy tannins, and flow into a clean slightly leathery finish. Quite a bit going on, and quite impressive, a testimonial to the potential of the land. 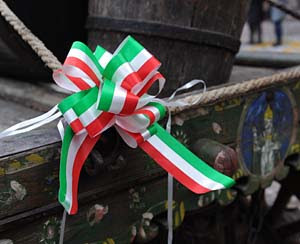 Castelluccio, which used barriques, was the first wine from Romagna to break out of the region and sell well outside of Romagna, commanding prices higher than those of Chianti Classico in places like Rome. Though it is now quite mature, it is quite obvious why it commanded the prices it did. Pale almandine with almandine reflections and orangeish rim. The bouquet is fairly rich, with unusual floral accents and savory notes, with some sea salt as well, and a slight balsamic underpinning with some herbal notes -- woodsy thyme with mentholated accents in particular -- the wine is not quite perfect, and this is the bottle. On the palate it's ample and mineral, with considerable savory accents and dusky balsam-laced berry fruit supported by moderate acidity and tannins that have a warm greenish burr, and flow into a warm savory finish. Impressive, and again clearly reveals the potential of the area. Which is considerable, though the vintage was weaker, and this wine is more tired. Innovation is a process of trial, experimentation, and reaction to the results of the trials and experiments, which are sometimes successful and sometimes less so. The 80s and 90s were a period of tremendous experimentation, with people trying new pruning techniques, new planting strategies, and new cellar techniques. Cherry ruby with black reflections and almandine rim paling to orange. The bouquet is fresh, with hints of balsam and berry fruit that bring to mind nougat somehow, and some menthol and leaf tobacco, with some leather too, and pleasant spice. Quite a bit going on. On the palate it's bright, with fairly lively warm sour cherry fruit supported by leathery accents and some spice, quite a bit of sea salt, and tannins that have a greenish burr, and flow into a warm savory finish. It's rich and smooth, and has a certain suppleness to the tannic structure that suggests it isn't completely Sangiovese. This was by Stefano Chioccioli, a leading Tuscan consulting winemaker whose wines tend to be richly fruit forward in youth. It's deep black cherry ruby with black reflections and some almandine in the rim. The bouquet is ripe, with fairly bright cherry fruit supported by some prune liqueur and candied accents, with some mineral notes, and some greenish vegetal accents with something fairly aromatic. On the palate it's ample and soft, with cherry fruit supported by smooth sweet tannins, while the acidity is firmly in check and the finish is rather bitter, a reflection of the oak. It's much less alive than the other wines, and while it may have been seductive and fruit forward in youth the production technique has penalized it with time. Experimentation continued, spreading to those who had been hesitant at first, and people began to get a feel for what they wanted to do. Deep black almandine with black reflections and almandine rim. The bottle is less than perfect, a problem that can happen with older wines. It's spicy, with candied accents and some mint supporting berry fruit and slight balsam and some leather as well, also Moroccan leather and some alcohol. On the palate it's also a touch tired, and this is again the bottle; reading between the lines there is pleasant acidity and slightly balsamic tannic structure supporting sour berry fruit while the tannins are dusky with a silky underpinning, and the finish is savory with some prune plum fruit and some dried mushrooms as well. An imperfect bottle, but one that clearly reveals the potential of the vintage. Fairly deep black cherry ruby with cherry rim. The bouquet is fairly intense, with berry fruit and some vegetal accents, balsamic acidity and spice and an underpinning of dried mushrooms. Pleasant but going in a different direction with respect to the earlier 70s wines. Much cedar too. All Sangiovese? On the palate it's ample, with cherry fruit supported by splintery accents, and moderate acidity; the acidity plays second fiddle to the tannins and flows into a bitter finish savory finish with some oaky accents. It revolves more around minerality and leafy notes than fruit, and this makes it more particular; my first impression was that it was less interesting, but fellow tasters rave about it and sipping it again makes me realize they have a point. It is in any case what one would call international in style. Deep cherry ruby with cherry rim. The bouquet is fairly intense, with considerable minerality and some iodine, and also hints of camphor and slight cedar. On the palate it's fairly rich, with lively cherry fruit supported by minerality more than acidity, and by tannins that have greenish vegetal accents and a warm pencil shaving graphite laced burr, and flows into a clean rather bitter finish. Interesting, and though it doesn't have the acidity that the earlier wines have, does display pleasing personality. I wonder if it is all Sangiovese. Deep black cherry ruby with cherry rim. The bouquet is fairly rich, with savory accents and warm berry fruit supported by sea salt, brings sweat socks to mind in a positive way. The palate is bright, with lively cherry fruit supported by considerable minerality and graphite shaving bitterness that flows into a clean bright mineral finish. Interesting, with considerable personality, and it does have Cabernet in it, which however hues to Romagna. Quite interesting. Further experimentation during the 1990s, some quite successful, and some slightly less so. Deep black cherry with cherry rim. The bouquet is warm and savory, brings well salted stewed tomatoes to mind, with savory notes and spice, and some berry fruit. On the palate it's ample, with rich jammy cherry fruit supported by tannins that are quite mineral and decidedly dusky, flowing into a dusky mineral finish. It's charged, and quite distinctive, a wine that you will like or not. Powerful too, and though Giorgio says it has Merlot I don't note it in the tannins -- though there is some cassis on the nose. Deep black cherry with black reflections and cherry rim. The bouquet is interesting, with candied accents and berry fruit supported by some leather and prunes, also savory notes and some caraway seed. Smoky notes too. On the palate it's fairly rich, with mineral laced berry fruit supported by greenish tannins that have a warm burr and flow into a fairly long rather bitter greenish finish. Unusual, and though I might have though there was something else, they say it's Sangiovese in purezza. Distinct with respect to the other wines. Claudio Fiore, Vittorio's son, was in Castelluccio for this, and oversaw bottling it. Cherry ruby with almandine in the rim. The bouquet is smoly and balsamc, with some animal hair and stable straw. On the palate it's bright, with savory sour cherry fruit supported by minerality and spice, and flows into a rather tannic finish. It's much greener than the earlier Castelluccio wine, and it's more of a food wine -- it will work very well with stews or roasts, and is less of a wine to sip far from the table. Quite fresh. Deep cherry ruby with cherry reflections. The bouquet is fairly intense, with brandied plums and cherries with some quite a bit of mint as well, and some cedar too. On the palate it's ample, smooth with cherry fruit supported by cedar laced tannins and some minerality while there is also acidity, though the tannins are carrying the show more than they did in the earlier vintages, where acidity played a greater role. The wine is particular, in that it's a late harvested wine, and the lower acidity comes out in this respect. 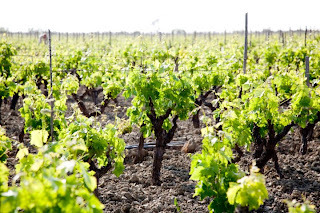 Following the period of intense experimentation in the 80s and 90s there has been a return to terroir, and an interest in making the wines reflect their vineyards. At the same time, however, vineyard technique has changed considerably, as have harvesting criteria and winemaking techniques. 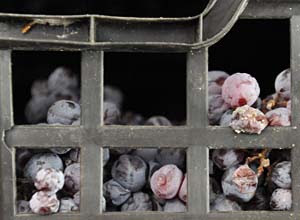 In particular, many winemakers aim for physiological ripeness, ripeness of the tannins, which comes later than sugar ripeness (that which will give a certain minimum alcohol content). The wines therefore tend to be more alcoholic and less acidic, though this is not a hard-and-fast rule. Deep cherry with black reflections and cherry rim. The bouquet is fairly intense, with animal accents and minerality supported by acidity and spice with a fair amount of balsamic accents too. On the palate it's rich, with jammy cherry fruit supported by minerality and slight acidity, and by tannins that are a fairly dusky mineral finish, with some greenish accents. It's fairly rich, but by now the acidity that was so distinctive in the early wines is gone. Much more tannins and structure, and much less acidity. Deep black cherry ruby with black reflections. The bouquet is fairly intense, with cherry fruit supported by some cedar and moderate acidity, with some minerality as well. On the palate it's bright, and fresher than I expected, with lively cherry fruit supported by dusky graphite shaving bitterness and some mineral acidity that flows into a clean rather bitter finish with dry tannic underpinning. Pleasant. Deep black cherry ruby with cherry rim paling to white. The bouquet is a bit more balsamic than some, with animal notes and some lathered horse, and as it opens rather penetrating brambly accents and some sea salt. On the palate it's ample, with fairly bright savory berry fruit supported by minerality and spice, and by tannins that have a warm savory notes and flow into a greenish mineral accents. It's fairly deft, with minerality that works well and gives nice depth, and will work well as a food wine. Deep cherry ruby with black reflections and cherry rim. The bouquet is fairly rich, with some berry fruit supported by greenish accents and slight burnt rubber, which sounds odd but is slight enough to just add depth, and some jammy cherry fruit accents too, with slight sweetness and moderate alcohol. On the palate it's ample and smooth, with moderate fruit supported by tannins that have a warm burr, and some acidity; the fruit is more evanescent than I might have liked. Deep black cherry ruby with black reflections. The bouquet is fairly rich, with ripe plum cherry fruit supported by floral notes and some sweetness, and by some savory accents. Quite concentrated and quite ripe. On the palate it's bright, and ripe, with fairly rich cherry plum fruit supported by tannins that are warm and greenish with a mineral underpinning and flow into a clean mineral finish. Pleasant, in a fairly mineral key, and it has quite a bit to say; the fruit is ripe but not overripe. Deep black cherry with cherry rim. The bouquet is moderately intense, with some berry fruit and some acidity, and also some savory accents with slight greenish notes. On the palate it's fairly direct, with savory accents and some spice, and tannins that are warm and splintery. It's not what I had expected given the earlier vintages -- it's neither as bright nor as lively, and lacks the pleasing deftness of its older siblings. Deep black cherry ruby with black reflections and cherry rim. The bouquet is fairly intense, and rather animal, with lathered horse and some wet stable straw and greenish balsamic accents with underlying brambles. Not much fruit. On the palate it's pleasant in a rather savory key with moderate fruit supported by powerful greenish savory notes, and flow sinto a clean rather savory finish with greenish accents. It's powerful, and a wine that you will like if you like the style, but you have to like the style, which is a bit rustic. It will work quite well with grilled meats or roasts if you like the style. Deep cherry ruby with black reflections and cherry rim. The bouquet is fresh, with jammy cherry fruit supported by some greenish vegetal accents and spice. Fairly direct. On the palate it's ample, with cherry fruit supported by moderate plum cherry acidity and by tannins that are smooth and sweet, and flow into a fairly sweet cherry finish. Direct, and fairly p front in a light key, with a fair amount of sweetness that will make it more approachable to those who are not traditionally minded, though someone who expects more acidity and tannin may wonder about it. Deep cherry ruby with cherry rim. The bouquet is rich, with pleasant violets and floral accents supported by some berry fruit and underlying spice. Quite young. On the palate it's bright and fresh, with lively cherry plum fruit supported by deft acidity and by smooth sweet tannins that balance the acidity, and flow into a clean fresh cherry finish. Beautifully fresh, one of those wines one can drink by the bucket. A fascinating tasting that on the one hand showed the evolution of the wines, from the tarter much more aggressive (in their youth) Sangiovese of the 70s though the lusher riper wines of today, and also the introduction of new kinds of wood for aging -- and the struggles to learn to use them rather than be used by them, and on the other confirmed the aging potential of the older styles of Sangiovese. I am not sure that the newer riper style will prove as long-lived, but it will be interesting to see. All those who undertake, or think about undertaking our profession, with is that of knowledge (and, and especially, criticism) of the world of food and wine, should meet Giuseppe (Beppe) Lo Russo. Why? Because he would make many understand (including me, as I have been in the front row for more than 20 years) that this isn't a job one invents, or that one turns to because one is bored with one's day job, or because one has lots of money and can therefore afford to go to many, often expensive restaurants. Doing this job right requires preparation, study, and culture that support and direct the choices the job sometimes requires. In these days of tremendous amateurism (and again I put my self at the front of the crowd, lest I offend someone) Giuseppe is a rarity, someone who started out with great Culture (note the quite Capital C) and dedicated himself to understanding and explaining the phenomena, cultural and non, that have affected the world of food over the past 30-35 years. I feel as if I'm listening to my high school history teacher: "To trace a history and understand it one need have a firm understanding of the two points that are its foundation: the present and the past." Giuseppe's historic grounding in gastronomy leads to lines of reasoning most of us are incapable of even dreaming of, and show us that the past is not what happened in our great grandparents' kitchens, to give an example, but what happened in the IV century BC, when hens, which are original to India and Persia, arrived in Greece and began to be known in the what was destined to become the western world. Personally, every time I talk to Beppe I am seized by the desire to change jobs, because I come face to face with the Socratic "I know I do not know," and this, despite my seven years of varies and desperate studies, makes me understand how much I will never be able to know. 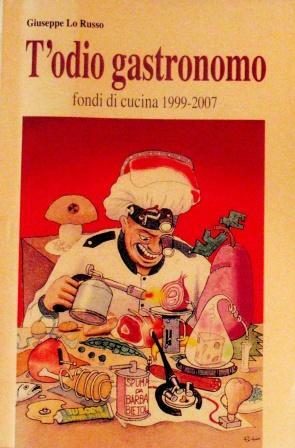 To begin to understand, in a light fun way, we can however all read his latest book, "T'Odio Gastronomo" (I hate you Gastronome), a collection of articles from 1999 to 2007 published by La Madia Travelfood, and now collected in a nice book that will delight you with Beppe's baroquely off-the-wall prose. 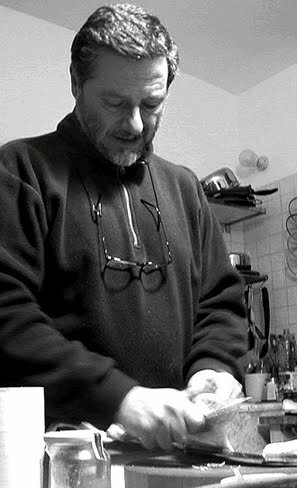 You'll go from vitriol-laced semi-mortal epee thrusts directed at more-or-less pompous, affirmed gastronomes to strong opinions on the history (history with a capital H) of gastronomy not just in Italy, and then reach a low-key, but sharp and precise look at wines and its trends during that period. You may find yourself trying to recognize this or that wine critic, thanks to episodes that are simply not to be missed. There are also comments on films, TV shows, food books in which he inevitably focuses on ignorance, approximation, and amateurism, presenting us with many Emperors "Sans Clothes" we will never forget. But in this game, which was our life from 1999 to 2007, Giuseppe doesn't hang back, but rather presents himself as what he sometimes is, but almost always enjoys being: a gruff curmudgeon with a heart of gold. What I don't want to forget to say is the bolt from on high I experienced while "on the way to Lo Russo," as I read the book. At one point I thought, "Culture can be nothing if not precise and enjoyable". Indeed, every passage of the book explains, clarifies, precise and on point, in fun, and wisely pleased prose. A decade of our gastronomic life captured by he who always tried to stay out of the crowd. Reading it lightly cannot but teach us something. Carmignano: The 2010, 2009 and 2008 Vintages - and More! 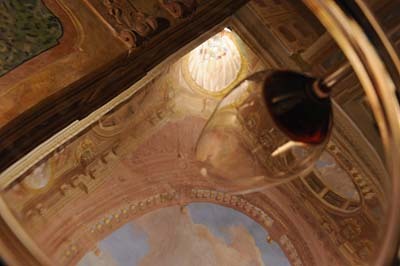 The Carmignano Appellation has just presented the new releases of Carmignano, a red wine that is similar to Chianti in that it is primarily Sangiovese, the classic Tuscan red varietal, and different because the Appellation requires 10-20% Cabernet, a nod to Cosimo III de'Medici, who planted and experimented uva Franciosa, as it was called, in his Carmignano vineyards in the early 1700s. Though the Cabernet has had time to become acclimatized and adapt to its Tuscan surroundings, 10-20% is quite enough to have a powerful influence upon the wine, and with respect to other Central Tuscan wines that lack it Carmignano tends to be more vegetal, with notes of hay or green vegetables, in particular bell pepper, on the nose, and earthy Cabernet-derived accents to the fruit, while the tannic structure also reveals Cabernet facets. In short, Carmignano stands out from the other Central Tuscan appellations, especially now that those in Chianti are turning away from the international varietals that were all the rage 10-15 years ago, and as such it offers a pleasant change of pace. For a considerably more detailed discussion of the appellation, see my introduction to the 2009 presentation. This year's presentation was once again held at Capezzana, which is by far the most important estate in the Carmignano appellation. The vintages presented ranged from 2011 for some of the whites and the Vin Ruspo, Carmignano's Rosato, to 2010 for the Barco Reale, Carmignano's ligher red, 2010 for most the Carmignano vintage wine, and on to 2009-2008 for the Riserva wines, while some of the IGT wines and Vinsanti were from older vintages. Taken as a group the 2010 vintage Carmignano displays considerable cabernet, which overshadows Sangiovese, presenting as vegetal accents and with a certain warmth. The 2009 and 2008 wines tend to be brighter, with the fruit shifted more towards red berry fruit and less towards plum, and are also markedly less vegetal. Brassy gold with brassy reflections and white rim. The bouquet is bright, with fairly rich floral accents mingled with straw, some brambly acidity vegetal underpinning. Zesty. On the palate it's fairly rich, in an ample key with strong slightly overripe white berry fruit supported by greenish bitter accents that carry into a fairly long finish with greenish accents and some butterscotch as well It's a little more charged than I might have liked on the palate, and heavy rather than agile, with a fair amount of alcohol as well. A wine that will work well with more substantial offerings that will profit from its power. Not much minerality; the fullness is more glycerin and alcohol. Brassy gold with brassy reflections and pale yellow rim. The bouquet is fairly intense, with pungent minerality and some butterscotch supported by dusky shadowy notes and some overripe pear, and brambly acidity as well. On the palate it's deft, with pleasant slightly bitter minerality supported by mineral acidity that flows into a fairly long mineral finish. Deft, in a decidedly mineral key, with more minerality than fruit acidity, and if you like the style you will enjoy it. Deep black cherry ruby with black reflections and cherry rim. The bouquet is fairly rich, with cocoa, slight sandalwood, and berry fruit mingled with some greenish vegetal accents, the combination somehow brings a hostess cupcake to mind. On the palate it's medium bodied, with rather smoky greenish vegetal notes supported by spice and menthol more than fruit, and it flows into a rather blocky peppery finish with spicy underpinning. It's a touch more vegetal than I might have liked. Deep black cherry with black reflections cherry rim. The bouquet is fairly rich, with smoky red berry fruit supported by greenish vegetal accents and some spice. On the palate it's medium bodied, with bright sour cherry fruit supported by smooth tannins that have a cedary underpinning and flow into a clean bright berry fruit finish with greenish tannic underpinning and fairly intense vegetal accents. Quite approachable in a young key, and will drink well with red meats. Deep black cherry ruby with black reflections. the bouquet is muted, though some greenish accents emerge, mingled with acidity and hints of balsam. Promising but not really developed yet. On the palate it's full, with rich cherry fruit supported by some greenish vegetal accents, sour minerality and tannins that are smooth and quite powerful, flowing into a clean sour berry fruit finish with tannic underpinning, Quite promising, and if the nose follows the palate's lead will be something to look out for. Brilliant brassy gold with brassy reflections. the bouquet is deft, and elegant, with mineral laced butterscotch supported by deft spice and some pleasing greenish vegetal accents. Nice depth. On the palate it's ample, and rich, with butterscotch laced minerality supported by mineral acidity and slight tannins that have a slightly brambly feel to them and flow into a clean dry butterscotch laced finish with some caramel overtones. Quite pleasant in a rich international key, and is one of the finer expressions of this wine that I have tasted; by comparison with other vintages more fruit and more minerality from grapes emerges, making it more interesting. Slightly duskier pink with brilliant electric pink reflections. The bouquet is moderately intense, with dusky red berry fruit supported by some bramble and savory notes, and moderate red berry fruit acidity. On the palate it's ample, with moderately intense raspberry cherry fruit supported by dusky acidity and tannins that have a slight burr, and flow into a warm rather sour mineral laced finish with bitter underpinning. A fairly direct wine in a simple up front key. Fairly deep cherry ruby with black reflections and cherry rim. The bouquet is fresh, with a great gout of greenish violets mingled with spice and leather; with a rush of sea breeze as well. Unusual. On the palate it's bright, with richer than expected cherry black currant fruit supported by graphite shaving bitterness and some vegetal accents, while the tannins are fairly smooth, and lead into a clean bitter finish. Fresh, and still a bit in the air; it will work well with simple grilled meats, for example thick burgers, and in the proper context will be perfect. But it does need until summer for the nose to come together. Impenetrable black cherry ruby with cherry rim. The bouquet is fresh, with violet laced plume cherry fruit supported by dusky greenish accents that bring gum Arabic to mind, and some spice as well. Quite young, but promises nicely. On the palate it's ample in a ripe key, with fairly rich prune plum fruit supported by moderate savory acidity and quite a bit of sea salt, and by tannins that have a warm cedary overlay with some sweetness from wood as well, and flow into a clean savory vanilla laced finish. Pleasant in a decidedly international key, and if you like the style is quite approachable and a wine you will enjoy considerably. Impenetrable pyrope with cherry rim. The bouquet is fairly rich, with vegetal laced berry fruit supported by greenish accents, chalk dust, and some peppery spice, also some berry fruit. On the palate it's bright, with fairly rich cherry fruit supported by greenish vegetal accents, peppery spice and tannins that have a warm peppery and belle pepper burr, flow into a sandalwood laced finish that's quite dry. It needs another year to come together, and will be quite different when it has. Impenetrable black cherry with cherry rim. The bouquet is fairly intense, with savory notes mingled with sandalwood and some balsam, and with some vegetal accents as it opens. On the palate it's ample and rich, with fairly intense cherry plum fruit supported by deft mineral acidity and by tannins that have warm slightly balsamic savory accents, and flow into a clean savory berry fruit finish. It needs another year to fold in, but is pleasant in a ripe key; while the fruit has shifted into prunes and plums there is still red fruit acidity, and this confers a degree of verve. Deep black cherry ruby with black reflections and cherry rim. The bouquet is savory; with some greenish accents that -- at first swish -- brought a bean pot to mind, and then opened to reveal vegetal notes more than fruit. It gives an impression of being in mod stride. On the palate it's fairly rich, with bright sour cherry fruit supported by tannins that have a warm balsamic burr and flow into a decidedly tannic finish. Needs another couple of years to come together and smooth, at which point it should be fairly traditional (and quite improved), though that's for the future, and not today. This is a blend of Cabernet Sauvignon, Syrah and Merlot. Impenetrable black cherry with cherry ruby rim. The bouquet is delicate, with floral accents and some minerality mingled with cherry fruit and some forest berry fruit, and also slight vegetal accents. Graceful in a lacy sort of way. On the palate it's ripe, with cherry plum fruit supported by lively sour berry fruit acidity and by tannins that are smooth and though well polished not retiring, and flow into a clean fairly bright tannic finish with hints of balsam and more evident savory berry fruit accents. Quite pleasant, though young, and will also age nicely for many years. This is a Merlot. Impenetrable black cherry ruby with black reflections and cherry rim. The bouquet is dusky, with underbrush and red berry fruit supporting some sour berry fruit and pleasant greenish accents; there's something voluptuous to it. On the palate it's bright, with lively sour cherry fruit supported by smoky accents and tannins that are warm and rather balsamic, and flow into a clean bright sour berry fruit finish with balsamic underpinning. Quite young but also quite pleasant with deft grace, and will drink very well with foods, and also age nicely for a decade or more. This is a Syrah. Deep pyrope ruby with some purple in the rim. The bouquet is muted, though swishing brings up some underbrush and savory accents with underlying cherry plum fruit. On the palate it's ample and fairly rich in a decidedly savory balsamic key with plum cherry fruit supported by warm savory tannins and sour balsamic acidity that flow into a fairly long savory tannic finish. It's quite young, and needs time to come together -- I had the impression of looking in on a nursery school with it. A bit too young to score, because it could go in any of several directions. All good, but I want to see where it goes first. Tawny amber with brilliant orange reflections and slightly greenish rim. The bouquet is powerful and sweet, with dried fruit, dates and figs, supported by some caramel and brown sugar, and warm nose tingling acidity with some almonds and walnuts skins as well. On the palate it's ample and languid, with rich date and fig fruit supported by bright date acidity and sweetness that is brown sugar with hints of maple, and the sugar is intense enough to leave a granular trail across the tongue, flowing into a fairly long finish that has some walnuts, and then fades into sweetness. Quite pleasant in a very sweet key, and if you like this sweeter style of vinsanto, which brings the wines of Montepulciano to mind, you will enjoy it. Pale pink with brilliant electric pink reflections. The bouquet is fresh and bright, with lively raspberry fruit and raspberry acidity supported by some red blossoms and slight jammy accents with hints of vegetal underpinning. Voluptuous, and the jam increases the curves. On the palate it's bright, with lively raspberry fruit that is supported by acidity and slight brambly tannins, and gains fullness from slight sweetness, which again accentuates the curves. Pleasant, and will be quite refreshing in the summer months, an ideal picnic wine. Deep black cherry ruby with black reflections and cherry rim. The bouquet is moderately intense, with red berry fruit supported by greenish accents and some mentholated notes, also some dusky black pepper and slight sandalwood. On the palate it's bright, with lively sour cherry fruit supported by tannins that have some cedary graphite shaving bitterness, and by warm sandalwood laced acidity, which flow into a clean rather vegetal finish with underlying grilled pepper and pencil shaving bitterness. Pleasant, in a fairly bright key. Deep pigeon blood ruby with black reflections and cherry rim. The bouquet is fairly intense, with powerful vegetal and bell pepper accents mingled with berry fruit and chalk dust, and some mentholated notes as well. On the palate it's medium bodied and fairly bright, with sour berry fruit supported by greenish almost balsamic tannins and warm greenish acidity that flows into a warm balsam laced finish that's rather blocky. I'd have liked more depth and verve. Deep black cherry ruby with black reflections and cherry rim. The bouquet is moderately intense, with polished leather and some spice mingled with cumin seeds and savory accents. Not much fruit, though as it opens some savory barnyard tang with greenish balsamic accents emerges On the palate it's medium bodied, with fairly rich sour berry fruit supported by berry fruit acidity and by tannins that have a warm savory burr and flow into a clean savory finish. It's a bit behind, the nose especially, and needs a year to come together and develop. It will with time become ethereal, in a traditional key, but has a little less fruit than I might have liked. Pale amber with brilliant apricot reflections. The bouquet is fairly intense, and fairly sweet, with greenish vegetal accents and green apricot mingled with some almonds and hints of dates and figs that as they gain in intensity replace the vegetal accents. On the palate it's fairly direct, with sweet dried fruit, dates in particular, and date sweetness, which gives way to walnut skins as it flows into the finish, which is walnutty. It's a bit more direct than I like, and the finish is rather abrupt, with the fruit dropping off to give way to the walnuts. Lively raspberry pink with brilliant electric pink reflections and pale rim. The bouquet is bright, with greenish vegetal accents mingled with slight bell pepper and sour berry fruit with hints of bell pepper jam as well. On the palate it's bright, with lively greenish sour berry fruit supported by bell pepper bitterness and by some savory notes, while there are also light slightly splintery tannins. Quite fresh, though a touch coarser than the Castelvecchio -- and this will make it better suited to accompanying fried white meats or fish, a summer favorite -- while it will be a nice picnic or cookout wine too. Deep pigeon blood ruby with cherry rim. The bouquet is moderately rich, with jammy cherry fruit supported by dusky spice more than acidity, and some greenish vegetal accents mingled with slight graphite shavings. On the palate it's brighter than expected from the nose, though in a brooding key, with fairly rich cherry fruit supported by tannins that have an abundance of bitter graphite shavings and flow into a slightly smoky sour bitter finish. The palate is more interesting than the nose, in a decidedly vegetal key, and it will work well with simple grilled meats or light stews. Impenetrable purple ruby ink with purple ruby rim. The bouquet is fairly rich, with red berry fruit laced with belle pepper and vegetal accents, and supported by some savory notes as well, and by some metallic smoke. On the palate it's ample and fairly smooth, with plum cherry fruit supported by dusky minerality and graphite shaving bitterness more than acidity, and flows into a rather dusky finish. Despite the ripeness of the fruit it's a brooding wine, and while I would have liked a little more verve out of personal preference it is quite harmonious, with everything precisely where it should be. Deep black cherry ruby with black reflections and cherry rim. The bouquet is moderately intense and somewhat greenish, with savory accents more than berry fruit. On the palate it's bright, with greenish sour cherry fruit supported by bright acidity and by tannins that have a splintery greenish burr and flow into a fairly long savory finish. I found the palate more interesting than the nose, though it is a touch thinner than I might have liked. Impenetrable black cherry ruby with black reflections and cherry rim. The bouquet is moderately intense, with India ink bitterness mingled with spice and iodine,a nd some plum cherry fruit as well. Coming together. On the palate it's fairly rich, with savory cherry plum fruit supported by considerable vegetal laced graphite shavings bitterness and tannins that have a warm burr and flow into a clean bitter finish. Promising, in a rather austere key, with more minerality and more vegetal accents than some, and will also age nicely. Deep black cherry ruby with black reflections and cherry rim. The bouquet is fairly rich, and quite mineral with some nose tingling acidity and spice, also some greenish wet leather. Dusky, bringing dappled shade to mind. On the palate it's pleasant, in a fairly mineral key, with savory red berry fruit supported by warm rather balsamic acidity and by smooth balsam-laced tannins that flow into a fairly long warm sour cherry finish. Pleasant in a fairly traditional key, and though one could drink it now it will have more to say in a few years, and will be reward those blessed with patience. Tawny amber with brilliant orange reflections and greenish rim. The bouquet is fairly rich, and sweet, with orange and slight quinine notes mingled with minerality and some almonds, bit none of the brown sugar or walnuts one often finds in a vinsanto. It's going in a slightly different direction, and interesting. 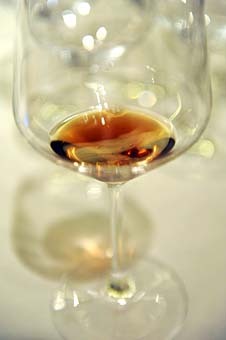 The palate reflects the nose; it's fairly sweet, with hints of orange and quinine bitterness that provides definition, and also some acidity, though its' more the quinine that carries the show, and it flows into a fairly bright bitter finish. Unusual; this is the first time I've encountered quinine in a vinsanto, and I'm not sure what to think of it. Deep black cherry ruby with cherry rim. The bouquet is intense, with mineral laced greenish bell pepper fruit supported by chalk and artichoke stem as well, and also some cedar. Shadowy. On the palate it's medium bodied with moderately bright decidedly vegetal fruit supported by tannins that have considerable graphite shaving bitterness and flow into a rather bitter savory finish. Smoky, and will work well with succulent meats. Moderately deep black cherry ruby with black reflections and cherry rim. The bouquet is moderately intense, with brambly berry fruit supported by sweetish accents and slight dusky graphite, with hints of underbrush as well. On the palate it's ample and rather languid, with rich, ripe, fairly sweet forest berry fruit supported by savory notes more than acidity and by tannins that are ample and have a slightly splintery burr that gives texture to their underlying smoothness. It's fairly voluptuous, in a rich ripe key, and if you like the style you will enjoy it. Deep black cherry ruby with black reflections and cherry rim. The bouquet is fairly intense, with considerable savory greenish vegetal accents and some peppery spice, but less red fruit that I might have expected. The French varietals seem to be covering a lot. On the palate it's ample, with cherry plum fruit supported by minerality and tannins that have a clean bright mineral burr to them, and flow into a vegetal laced finish with black currant fruit underpinning that fades to savory notes. Pleasant in a fairly ripe key, and needs another year to come together. Deep black cherry with black reflections and cherry rim. The bouquet is moderately intense, with berry fruit supported by savory accents, some black pepper, slight greenish notes, and hints of petroleum. On the palate it's ample and smooth, with fairly rich sour cherry fruit laced with black currant fruit and supported by sour mineral acidity and tannins that are smooth and slightly glancing, flowing into a savory mineral finish with underlying tannic burr. Pleasant in a young key, the tannins are still coming together. Will age well. Pale cherry ruby with white rim. The bouquet is fairly bright, with zesty greenish vegetal accents supported by acidity and moderate red berry fruit. It's still coming together. On the palate it's fairly light, with fresh sour cherry fruit supported by fairly bright mineral acidity with some fruit overtones and by tannins that are light and flow into a clean sour berry fruit finish. A pleasant lark of a wine that will work quite well with meat based pasta dishes, simple grilled meats, including fattier cuts such as lamb chops, and also has the acidity necessary to work well with fried meats and vegetables. It doesn't try to be more than a Barco should be. Deep black cherry ruby with black rim. The bouquet is a bit up in the air, with airiness that brings paper to mind supported by chalk and some greenish accents. On the palate it's medium bodied, with dusky rather bitter fruit supported by tannins that have a splintery burr; it revolves more around bitterness than fruit, and will most likely continue on this path with time. Deep black cherry ruby with black reflections and cherry rim. The bouquet is fairly rich, with cherry plum fruit supported by some yellow peach, and by greenish accents as well, with some spice too. On the palate it's bright, with lively sour cherry fruit supported by warm berry fruit acidity that has a slight greenish cast, and by tannins that are warm and rather balsamic, flowing into a warm slightly balsamic sour berry fruit finish pleasant in a more traditional key, and though it needs time will already work well with steaks or other hearty grilled meats. Deep black cherry ruby with black reflections and cherry rim. The bouquet is muted, though swishing brings up bramble and minerality with dried artichoke stem greenness and some spice too. Not much fruit On the palate it's bright, and quite vegetal, with artichoke more than bell pepper greenness, and smooth dusky greenish tannins with some balsamic accents, and it flow into a warm fairly greenish finish. It's still very young, and needs at least a couple of years to come together. Deep black cherry ruby with black reflections anc cherry rim. The bouquet is muted, swishing brings up savory notes, slight balsam, and spice more than fruit. On the palate it's ample with moderately intense berry fruit supported by tannins that are warm and quite forward, laying a spicy veneer over the tongue. Very young, and needs time. I would have however liked more fruit. Deep black cherry ruby with black reflections and cherry rim. The bouquet is fairly intense, with smoky savory notes and balsamic accents mingled with cocoa and some greenish vegetal accents. On the palate it's ample and fairly irpe with plum fruit supported more by minerality than acidty, and by tannins that are cedar laced and flow into a cedar laced finish with underlying bitterness. I's have liked more depth and verve; it's a little flatter than I might have wanted. Deep pigeon blood ruby with black reflections and cherry rim. The bouquet is bright, and fairly fresh, with dusky violets supported by sea salt and bell peppers with some artichoke greenness as well, and by underlying forest berry fruit. Nice depth. On the palate it's bright, with lively sour cherry black currant fruit supported by tannins that have a cedary underpinning and are still quite dry, need time to fold in. Promising however, and will do interesting things with time, I think. It grew on me. Deep black cherry ruby with black reflections and cherry rim. The bouquet is moderately intense and quite green, with artichoke stems more than peppers and some tobacco, with slight savory notes as well. On the palate it's brighter than expected, with lively sour cherry fruit supported by sour berry fruit acidity that has some bell pepper accents, and by tannins that are warm and slightly cedar laced with hints vanilla and sandalwood, and flow into a clean sour berry fruit finish with some vegetal accents. Pleasant though young, and will do interesting things with time. Impenetrable pyrope with cherry rim. The bouquet is fairly intense, with balsam laced prune cherry fruit supported by savory notes and hardwood ash with some greenish vegetal acidity. On the palate it's pleasant at the outset, with fairly rich cherry plum fruit supported by moderate mineral acidity that surrenders to cedar laced tannins that flow into a fairly long, quite powerful cedar laced finish. At present the tannins are overly dry and bring the fruit to its knees; we will have to wait to see how they fold in with time. This is a blend of Cabernet Sauvignon, Merlot and Cabernet Franc. Impenetrable pyrope with cherry rim. The bouquet is muted, though swishing brings up some plum cherry fruit supported by delicate vegetal accents mingled with some cut squash and hints of shellac. On the palate it's fairly rich, with cherry plum fruit supported by balsamic accents, and by tannins that are warm and balsamic, and at present gradually emerge, predominating. A little too much oak for me now, and I doubt the fruit will ever really throw it off. Deep black cherry ruby with black reflections and cherry rim. The bouquet is fairly sharp, with penetrating greenish accents and acidity supporting prune plum fruit, and some vegetal notes as well with a savory underpinning. On the palate it's riper than I expected, with fairly intense prune fruit supported by tannins that have a greenish cedary overlay and by moderate minerality more than fruit driven acidity, which flows into a fairly long greenish finish that has hints of sweetness, which are likely alcohol. Approachable in a ripe key, and if you like the style you will enjoy it. But do give it a couple of years to get its bearings. Impenetrable pyrope with cherry rim that has hints almandine. The bouquet is intense, with greenish accents and sea salt supported by some vegetal notes, more grass and Sichuan preserved vegetable than bell peppers. On the palate it's rich and languid in a quite ripe key, with rich plum fruit supported by deft acidity and by tannins that have a slight vegetal burr, and flow into a fairly long, fairly sweet prune finish. Pleasant in a decidedly international key, and if you like rich ripe fruit driven wines you will enjoy it; the palate is ahead of the nose and I would give the nose another year to come together. Impenetrable black cherry ruby with cherry rim. The bouquet is powerful and fresh for a Riserva, with violets mingled with spice and sandalwood with some nose tingling vegetal acidity as well. On the palate it's ample and quite ripe, with rich plum cherry fruit that's fairly sweet supported by tannins that have fairly intense barrel sample bitterness to them, and some mineral acidity that flows into a dusky plum fruit laced mineral finish. Opulent, and as the tannins smooth and fold in it will be even more opulent. Deep black almandine with black reflections and cherry rim. The bouquet is intense, with savory smoky sea salt and spice, and is also rather penetrating. Not much fruit. On the palate it's ample, ans sweeter than I expected, with vegetal notes that carry more than the plum prune fruit present, and mineral acidity, while the tannins are warm and splintery, flowing into a clean rather mineral finish with some underlying plum fruit. It needs time, a year or two, and is a little riper than I might have liked, Personal preference. This is a Cabernet Franc. Impenetrable pyrope with black reflections and cherry rim. The bouquet is fairly intense, with savory notes and underbrush mingled with deft red berry fruit and some acidity; nice depth and harmony, and as it opens there are hints of yellow peach as well. On the palate it's bright, with lively sour berry fruit supported by peppery spice and tannins that have a warm savory burr, and flow into a clean savory finish with hints of cocoa and underlying berry fruit. A different varietal? Perhaps; it revolves more around finesse than power, though there is that too, and it has nice aging potential as well. Deep black cherry with black reflections and cherry rim. The bouquet is fairly intense and quite vegetal, with greenish berry fruit accents mingled with sandalwood and spice that almost brings incense to mind, On the palate it's ample and quite ripe with cherry and back currant-cassis fruit supported by tannins that have an inky graphite shaving overlay, and by minerality more than acidity, which flows into a clean rather mineral tannic finish. It's not quite lush enough to be a sexpot wine, but is pleasingly fruit driven and headed in that direction. If you prefer tighter wines with more acidity and more aggressive tannins it won't work as well for you. Impenetrable pyrope with cherry ruby rim. The bouquet is intense and rather vegetal, with red berry fruit supported by cut squash greenness mingled with chalk and a certain acidic sweetness. On the palate it's full, quite riep,a nd fairly sweet, with plum cherry fruit supported by sweetness as much as acidity and by greenish accents that flow into a clean fairly soft plum finish The ripest, sweetest wine tasted so far, something of a starlet in a glass, and if you like the style, which revolves more around alcohol and sweet ripeness of fruit than tannins or acidity, you will enjoy it. But you have to like the style, which is frankly atypical for Carmignano. Impenetrable black cherry ruby with cherry rim. The bouquet is powerful, and quite green, with cut squash greenness supported by some sour berry fruit and spice; there's something heady to it. On the palate it's full and quite riep, with greenish cherry plum fruit that whose vegetal accents echo the cut squash on the nose, and flow into a greenish berry fruit finish with savory underpinning that becomes quite splintery. It's rich and a bot overripe, and needs another couple of years to get its bearings; I'd have liked a little more aicifty because as the tannins smooth it will I think become rather brooding. Deep black cherry with black reflections and cherry rim. The bouquet is fairly rich, with cassis fruit and some sweetish jammy accents mingled with slight vegetal accents and spice. On the palate it's ample and ripe, with cherry plum fruit supported by savory notes more than acidity, and by tannins that are ample, with a slight burr, and flow into a slightly splintery fairly sweet fruit laced finish. It's up in the air, but if it comes down right will be pleasant in a ripe soft key. The Cirò Appellation is probably the best known of the nine present in Calabria. 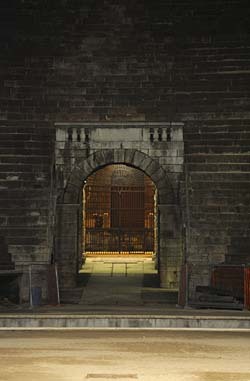 It has recently been the subject of considerable debate, argument, worry, and the taking up of sides for and against, because some thought it time to change the blend to meet the "needs" of the (foreign) markets: Gaglioppo by itself was no longer sufficient, they said, and indeed it was to blame if Cirò didn't sell briskly enough. A flash of forward-looking "genius," this, that led to the decision to allow Gaglioppo to be accompanied by the standard varietals known the world over, such as Cabernet and Merlot (yes, the list also includes Sangiovese and Barbera, but it's easy to guess how many will use them). Sergio and Francesco Arcuri's family has some of the oldest winemaking roots in the Cirò area, though this history almost came to an end when their grandfather sold everything he had inherited from his father. 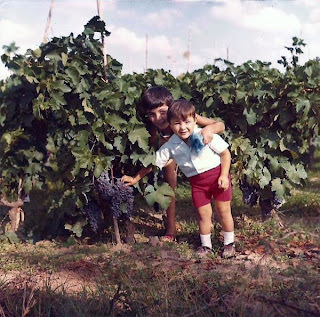 Fortunately their father Giuseppe, who had helped his grandfather cultivate the vines, loved them and the wine they gave too much, and his desire to return to winemaking proved stronger than the economic and health-related hardships he faced. Thus he began to buy small parcels of land planted between 1948 and 1980 in the alberello or bush style, as tradition dictates. In 2005 they added 1.75 hectares trained to the cordon spur system, for a total of 3.75 hectares. The first bottlings were in 2009, when they finished renovating their father's cellar. Sergio told me, "We cultivate vineyards panted in 1948 and 1980 to the alberello style that we have no intention of ripping out despite the EEU contribution of 18,000 euros per hectare given those who replant. Rather than give money to people who do so, they could give them to people like us, who care for them lovingly and with a great deal of patience. Cultivating an old vineyard takes twice as much work, all by hand. 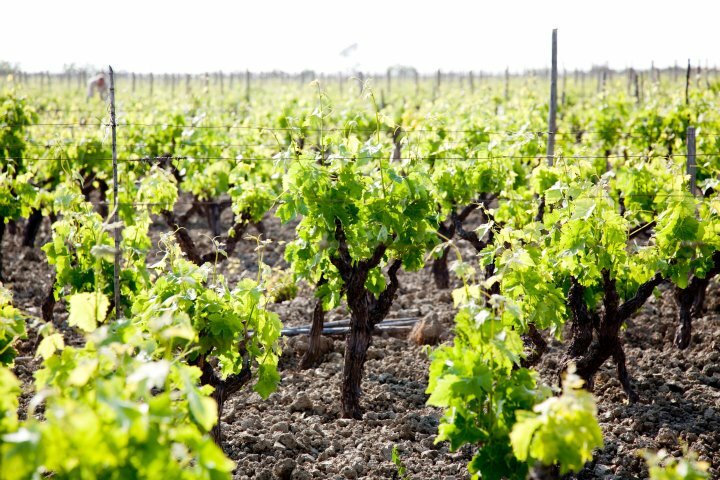 "We don't cut corners in the vineyards, but do everything necessary to maintain the land and therefore the vineyards. We still use hoes to break up the ground around the vines, have never used weed killers, nor fertilizers, and our treatments are limited to sulfur and copper, the latter used as sparingly as possible because of the limited rainfall we get. The last sulfur treatment is usually 50 days prior to the harvest, which begins at the beginning of October, and is manual. "In the cellars we still do things by hand; we ferment our red, "Aris," the way our great grandfather Giuseppe did, in an open-topped cement tank with submerged cap for about three days, without temperature regulation. For the rosè, which takes its name from the "Il Marinetto" vineyard, the grapes are picked around September 20; the must macerates briefly on the skins, and is immediately racked to cement tanks and kept at a temperature of 17 C. The vineyards are being declared officially organic (though they have always been cultivated organically) , and the only thing left to certify is the cellar." Sergio also told me how they settled upon their logo: "the circle is the imprint left by the bottom of a wet wine bottle, while the branches are the tendrils of a vine. "I picked the tendrils because I think of them as the hands and arms of the shoots; it's exciting to see how, in the month of May, day by day the shoots, with the assistance of the tendrils, grip the guy wires and the canes, because in the old alberello vineyards every vine has its cane; I remember when I was a boy, watching my father break the tendrils and tie the vines with shoots of ginestra (the broom plant) where he wanted them to be, bringing order to the shoots, and I would ask "Why are you doing this?" 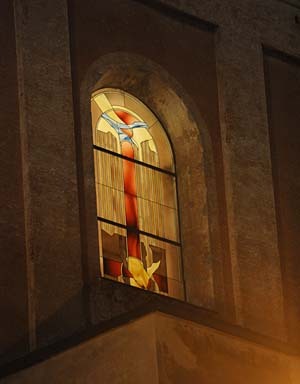 And he would answer, "The shoots already have strings with which to hold themselves; they may not stay where you want, but leave them be because they are alive." As Sergio told us, thy only make two wines, Cirò Rosso Classico Superiore Aris and Rosato Il Marinetto, both exclusively from Gaglioppo grapes. For the former wine, from the 2009 vintage, 2600 bottles, and for the latter, from the 2010, about 2600. Calabria boasts a long tradition of rosè wines, especially in the Cirò zone. Gaglioppo "en rose" has considerable allure, because it keeps its structure and energy, remaining quite recognizable, but gains fresh liveliness without becoming humdrum. Il Marinetto 2010 is garnet pink, an ancient color that brings to mind the evening colors of some freshly plowed grounds ready to be seeded. Nose with crunchy cherries, raspberries, red orange accents, pomegranate, and intriguing floral notes. The palate has nice fleshy fruit and vivid freshness; the tannic timbre reflects the vine that is the symbol of Calabrian winemaking, and all flows cleanly and pleasantly, stimulating salivation that will in turn stimulate the appetite, and we have no intention of not satisfying it! One can tell the style of Casa Arcuri is traditional simply by looking at the wine in the glass; it's a crystalline garnet quite reminiscent of the Nebbioli from Gattinara. The nose displays the aromas characteristic of the varietal, with ripe cherries, prunes, and spice, though there are also underbrush, ferns, hints of dried mushrooms, licorice, slight leather and tobacco, and an underlying sweetness that invites one to drink. On the palate is has very juicy, creamy fruit; one can taste the quality of the grapes, there's nice freshness and pleasant savory accents, while the tannins are perfectly integrated and do not disturb. A warm, long finish; everything is "classic" but in the positive sense of the term, there's nothing contrived from the cellars, just the grapes transformed into wine. One could call it a perfect example of the confluence of man, grapes, and land. I personally find it inspiring. 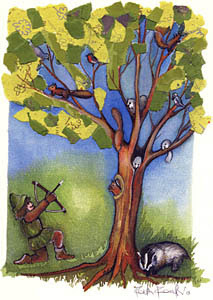 The least offensive, given current sensibilities, are dishes made from songbirds, eel or hare. 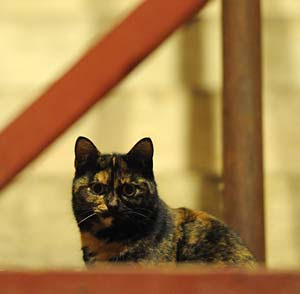 The most objectionable, in addition to cat, which always appears in these lists, are bear, hedgehog, turtle, sparrow, swan, porcupine, squirrel, badger, and dormouse. 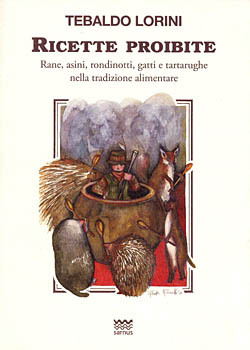 The "forbidden recipes" are all lined up, discussed, and published by the Florentine publisher Sarnus, directed by Mugello native Tebaldo Lorini. He's actually quite refined, an expert in folklore, cooking and art. Who had the courage, in these hypersensitive days, to dust off the Italian traditions regarding dishes that were heretofore simply classics of Cucina povera, the cooking of necessity, and its variant, hunting cooking. He presents it all unapologetically, pointing out matter-of-factly that despite the beliefs of the general population, there's little real difference between a stew made from veal and one made from badger. And also that in the past there was much less attention given to distinguishing between comestible and uncommestible animals. In his book (75 pages, 10 Euros) Mr. Lorini indeed shows how, exception taken for the most exotic meats where one happens to be (in some parts of Africa butchering gorillas and putting them on display is normal, as is the case for snakes in China, dogs in Korea, lama in the Andes, and kangaroo in Australia), and prohibitions based more on laws than morals, even in Europe the boundary between the two categories is quite indistinct, shifting from place to place and generation to generation. 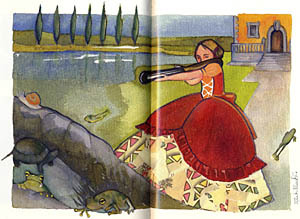 Without getting into the sewer rats eaten in Paris during the Prussian siege of 1870, Mr. Lorini notes that in the same city, and during the same year, a top restaurant such as Voisin, in Rue Faubourg Saint Honorè didn't hesitate to offer its patrons, as a Christmas dish, donkey head. "Without overlooking," he says, that times of want have always brought about advancements in cookery: people developed new methods for making appetizing things that weren't in the least." Having torn down the wall of need, and built that of cultural prejudice, modern society is gradually expunging from its recipe collections those meat dishes made from animals whose consumption upsets common sensibility. Without, however, managing to remove them from memory or from daily conversation or popular sayings: when you say, "don't say cat unless it's in the bag," as Trapttoni (the former coach of gli Azzurri, the Italian national soccer team) once did on TV, you don't realize -- Mr. Lorini warns -- that you are referring to a technique used to butcher cats, which was to put them in a bag and pound them against a wall. It's not by covering one's eyes or sticking one's fingers in one's ears that one can change the taste of a dish. Examples? Here are a few, from the index of the book: stewed hedgehog, pot roasted foxes, turtle ragout, grilled bear steak, pan-cooked sparrows, swan à l'orange, crow ragout, cat cooked in milk, porcupine stew, honeyed dormice, stewed squirrel, and badger stew. Enjoy your meal (or burn with rage). 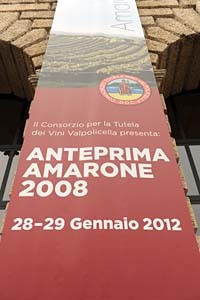 This year in the folks in Valpolicella presented the 2008 vintage of Amarone, which was a fairly difficult vintage, one that wasn't particularly hot, and therefore yielded wines that are not tremendously powerful (for Amarone), with in many cases relatively lower residual sugar contents and greater freshness that we have seen in some recent vintages. They are also wines that will probably not be as long-lived as one might expect of, say, the 2006 vintage, but that will also be readier sooner and more enjoyable in the short term. In other words, wines to enjoy while we give wines from the better vintages time. And in this the Anteprima was both enjoyable and interesting. Unfortunately, there are also clouds in the picture. Over the past ten years winemaking in the Valpolicella has changed tremendously, and this year Emilio Pedron, the President of the Consorzio, said, "From 2000 to 2011 we went from the sale of 5 million bottle to the sale of 12 million bottles of Amarone, to which one must also add more than 20 million bottles of Valpolicella Ripasso (the top-tier Valpolicella Superiore, which gains body and depth by being passed over the marks left in the fermentation vats when Amarone is racked off). Obviously, the number of bottles of Valpolicella Base (the Valpolicella's simple quaffing wine) dropped drastically, from 50 million to less than 25." And herein lies the rub. Valpolicella is a fairly small area, a set of north-south trending valleys that descend like the fingers of a hand from the foothills of the Alps behind Verona towards the Pianura Padana, and the viticulturally suitable land is both finite and well differentiated: there are steeper slopes on the valley walls, gently sloping areas, and what are almost flatlands where the valley floors broaden. In the past, as one might have expected, Amarone and Recioto were made from the grapes grown on the very best land, mostly the well exposed, well drained more elevated regions, while the grapes grown in the lower, flatter regions went to make straight Valpolicella, a light every day quaffing wine. With the increase in Amarone (and Valpolicella Superiore) production, given the finite vineyard area of the region, grapes from vineyards that were in the past used to make Valpolicella are instead being used to make Amarone, and while some of the vineyards previously dedicated to Valpolicella are capable of providing grapes suitable for Amarone, with many it is a bit of a stretch, and as a result a significant percentage of the new production Amarone is not of the same quality as what comes from the area's better vineyards. Then why make it? Simple economics, alas: Amarone is a hot name, selling for considerably more than any of the Valpolicella's other wines, and the temptation to make it, albeit to a lower standard, and bring in those earnings is very strong, especially among the larger producers, which also include some very large cooperatives. 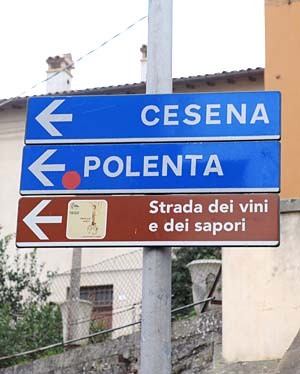 Because of this situation, before buying more than one bottle of an Amarone that you are not familiar with, you should taste it, or check the tasting notes of a wine writer whose palate you agree with. 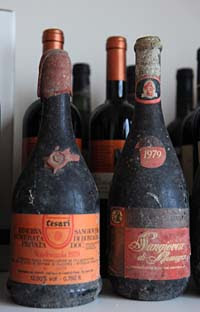 This policy of expansion has led to considerable resentment among those who believe Amarone should be the highest expression of the Valpolicella, made only from the best vineyards. 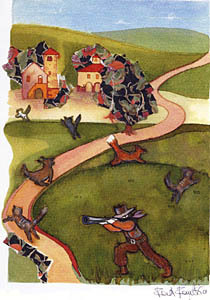 Some of the unsatisfied have formed an organization called Famiglie dell'Amarone, which consists of 12 wineries (you'll find the membership here) dedicated to preserving the artisinal characteristics of Amarone, while there are other winemakers who are just as dissatisfied, but have chosen to take a less confrontational path. The Famiglie deserted the Anteprima this year, and there were also other important names missing that had been present in the past, for example Trabucchi and Tommaso Bussola; since I didn't have occasion to talk to them, I don't know if their absence was dictated by philosophical considerations, or by timing -- some of those who bottle later in the spring prefer not to present barrel samples because they are works in progress. The bottom line is that it was an interesting, though incomplete presentation. The larger wineries were present, as were a fair number of well known smaller wineries, and there were also some interesting new names. But you will note that some of the names people tend to mention when talking about Amarone are absent. I rather hope they choose to present their wines again next year, mostly because the Anteprima is an occasion for those from far enough away that a road trip to Verona is out of the question to get a feeling for the wines, and the more wines they taste the better the picture they have. The other thing I hope gets reinstated next year is winery visits; this year there was a tour organized for foreign journalists the day after the formal tasting, but those who live in Italy were not invited, and it seems a pity not to take advantage of people's being there to show them around. Lively cherry ruby with black reflections. the bouquet is bright, with lively cherry fruit supported by graphite shaving and greenish menthol, also considerable spice and a fair amount of alcohol. On the palate it's fairly rich, with bright berry fruit supported by some sweetness, tannins that are fairly bitter with a slight greenish burr, and minerality more than acidity, flowing into a bitter mineral finis with graphite shavings and berry fruit underpinning. Fairly direct, should age nicely. Very young. Deep black cherry ruby with black reflections cherry rim. The bouquet is closed, swishing brings up minerality and spice with some graphite shavings some greenish accents. On the palate it's ample and fairly rich, with bright sour cherry fruit supported by slight mentholated acidity and by tannins that are ample and smooth, flow into a mentholated berry fruit finish with hints of pepper jam. Fairly direct, and quite approachable, will age nicely and may do interesting things with time. Deep black cherry ruby with black reflections and cherry rim. The bouquet is bright, with sour cherry fruit laced with India ink and some hints quinine, also some graphite shavings. Gives impression overripeness. On the palate it's ripe, with cherry plum fruit supported by dusky tannins and moderate acidity, while there are greenish sandalwood accents as well, and it flows into a rather bitter berry fruit finish. Fairly direct, and with time may become rather austere. Deep black cherry ruby with black reflections cherry rim. The bouquet is medicinal, with herbal accents and some eucalyptus mingled with sour cherry fruit and some underlying spice; it somehow brings a Barolo chinato to mind On the palate it's ample and fairly sweet, with moderately intense cherry fruit that gives way to blocky greenish tannins and moderate mineral acidity, and as the fruit fades the medicinal elements of the nose reemerge and carry at fair length. It's a little unusual, and the medicinal notes may be wood-fruit interaction. Deep black cherry ruby. The bouquet is closed, some spice, some berry fruit, savory notes and sandalwood with some bramble too. On the palate it's fairly direct, with moderately intense sour plum -- not prune, but more red plum -- cherry fruit supported by moderate sour cherry acidity and by tannins that are warm and cedar laced, and flow into a long warm tannic finish with savory accents. Quite approachable, but a touch more direct than I expect an Amarone to be; we will see what happens when it is in bottle. Deep cherry ruby with black reflections and cherry rim. The bouquet is muted, though swishing brings up some mint with hints of cocoa; the combination brings an After 8 mint to mind. Not much fruit. On the palate it's full, with minty sour cherry fruit supported by slight sweetness and by tannins that are strongly cedar laced and flow into an ample fairly dry tannic finish that echoes the mint on the nose, with some berry fruit as well. It's fairly direct, and I might have liked more complexity; also, at present the tannins are still quite invasive, and I'm not sure they will ever completely fold in. Deep black cherry ruby with black reflections and cherry rim. The bouquet is fairly intense,with jammy cherry fruit with some sandalwood accents, sweetness, and some spice, mingled with slight graphite shavings bitterness and hints of scalded milk/cedar. On the palate it's ample and fairly sweet, with ripe cherry plum fruit supported by mineral acidity and by powerful tannins that have a spicy burr and flow into a clean rather peppery bitter finish. Promising in a fairly direct muscular key. Deep black cherry ruby with black reflections and cherry rim. The bouquet is moderately intense, with candied almonds and marzipan mingled with some red berry fruit and underlying spice; it gives an impression of being in the coming together phase. On the palate it's not as concentrated as I might have expected, with fairly thin (for an Amaone) sour berry fruit supported by mineral acidity and tannins that have a dusky graphite shaving burr, and flow into a fairly dry finish with a fair amount of alcohol. It may become ethereal with time, but I expect more concentration from an Amarone. Deep black almandine with black reflections and almandine rim. The bouquet is moderately intense and smoky, with hardwood ash mingled with mentholated fruit, some sandalwood, and jammy berry fruit accents with some cumin spice as well. On the palate it's fairly sweet, with ample cherry plum fruit supported by moderate acidity and by tannins that are ample and blocky, and flow into a blocky tannic finish that gradually resolves into sweet cocoa dust. It's big, and brings to mind a person walking with clogs. Deep black cherry ruby with black reflections and cherry rim. The bouquet is fairly intense, with smoky hardwood ash at first swish, and jammy berry fruit following; with some sour accents as well. On the palate it's fairly rich, with bright sour cherry fruit laced with sandalwood and spicy greenish accents, and a deft savory underpinning, while the tannins are tight and fairly bitter, with some graphite shavings. Promising in a middle of the road key, and may become ethereal with time. Deep black cherry ruby with purple rim. The bouquet is up in the air, with heady menthol and spice and some red berry fruit. On the palate it's ample and fairly direct, with moderately intense berry fruit supported by sandalwood and savory accents that become rather balsamic in the finish. I'd have expected a little more concentration, and it seems soon for this degree of balsam. Deep black cherry ruby with black reflections and cherry rim. The bouquet is smoky with a fair amount of cedar and some berry fruit. On the palate it's ample, and direct, with moderately intense cherry plum fruit supported by mineral acidity and tannins that are fairly smooth, with a bitter underpinning. Dusky with some animal accents and reduced aromas; this can happen in a barrel sample. On the palate it's bright, with fairly rich cherry plum fruit supported by slightly balsamic greenish acidity, and tannins that have a spicy sandalwood burr, and flow into a fairly bright vegetal laced finish with dry tannic underpinning. It's like a person one has looked in upon while taking a shower, and a bit out of sorts, but what there is promises well. Deep black cherry ruby with black reflections and cherry rim. The bouquet is bright and fairly floral, with cherry fruit supported by plum accents and spice. On the palate it's ample and quite ripe, with moderately intense plum fruit that gradually settles below tannins that are broad and quite cedar laced, with some balsamic accents. Impenetrable pigeon blood ruby with cherry rim. The bouquet is spicy, with bitter smoky savory accents and as it opens considerable grilled green pepper mingled with prune and raisin, with hints of sweetness; with further swishing pencil shavings also enter the picture. On the palate it's fairly sweet, with plum fruit supported by balsam laced cedary tannins that flow into a warm savory alcoholic finish. It's quite ripe, and rather charged in a vegetal key, and is one of those wines you will like only if you like the style, which is in some ways winks at Recioto. Deep black cherry ruby with black reflections and cherry rim. The bouquet is moderately intense, with berry fruit supported y some mentholated accents and some sandalwood with slight underlying cumin seed; and as it opens spicy graphite shavings with slight vegetal accents. On the palate it's fairly rich, and quite ripe, with cherry plum fruit supported by moderate dusky acidity and by tannins that have a distinct greenish burr and are supported by a fair amount of alcohol, which flows into a fairly sweet peppery berry fruit finish. It's woefully young and needs a few years to come together, but may do so nicely. Scoring now is like betting on the wind. Deep black cherry ruby with black reflections and cherry rim. The bouquet is fairly intense, with berry fruit and some mentholated accents. On the palate it's ample, with fairly rich quite ripe cherry fruit supported by some jammy accents, moderate acidity, minerality, and tannins that have a slightly greenish splintery burr and flow into a fairly sweet almost candied plum finish. Something of a work in progress. Deep black cherry with black reflections and cherry rim. The bouquet is muted, though swishing brings up wet tree bark, spice, and some greenish accents with underlying ripe red berry fruit and some savory accents. On the palate it's full, with fairly rich cherry fruit supported by moderate acidity and by tannins that have a warm savory burr and flow into a fairly long cherry finish. It's fairly direct, in an up front sort of way, and promises nicely, though it has a ways to go. The nose is behind with respect to the palate at present, and it needs at least a couple of years to catch up. Lively black cherry ruby with black reflections and cherry rim. The bouquet is fairly intense, with powerful dusky vegetal accents, grilled green peppers in particular, and some underlying spice with slight graphite shavings bitterness. As a fellow taster notes, these are not typical aromas for Veronese grapes. On the palate it's fairly rich, with graphite laced berry fruit supported by slight sweetness and by tannins that have greenish cedary accents, and flow into a fairly bitter tannic finish with powerful grilled pepper accents that echo the nose. It's quite young, and rather light for an Amarone, and I would have liked more concentration. And less bell pepper. Deep black cherry with black reflections and cherry rim. The bouquet is muted, though some candied cherry fruit -- almost gummy bear -- emerges with mentholated accents and some fairly bright spice. On the palate it's fairly bright, with lively berry fruit that's much more sour than I expected supported by bright slightly mentholated berry fruit acidity, and flowing into a fairly quick warm finish with lasting cedary dryness. It's going in several directions, as barrel samples often do, but shows promise. Deep black cherry ruby with black reflections and cherry rim. The bouquet is powerful, with menthol and candied accents supported by some marzipan and mentholated eucalyptus laced berry fruit. In mid stride, and there's ample alcohol as well. On the palate it's bright, with sour berry fruit that's a little thinner than I expected supported by mineral acidity and tannins that are dusky with considerable graphite shaving bitterness, and flow into a rather bitter savory finish. It needs time, but I found it lacking in flesh. Not quite emaciated, but the bones are showing. It may with time become lacily ethereal, but that is for the future. Deep black cherry ruby with black reflections and cherry rim. The bouquet is dusky and rather mineral with unusual greenish accents that are fairly chemical. On the palate it's disconnected with respect to the nose, with unexpectedly sweet prune fruit supported by moderate acidity, just enough for steerage, and tannins that are ample and blocky. It lacks the verve and excitement I expect from an Amarone. Deep black cherry ruby with black reflections and cherry rim. The bouquet is muted, of the lights out nobody home variety; with swishing slight prune manages to emerge. On the palate it's ample with moderately intense prune fruit supported by tannins that have smoky sour accents and flow into a blocky tannic finish. It's fairly direct, and rather settled. Deep black cherry ruby with black reflections and cherry rim. The bouquet is fairly intense, and greenish, with spicy notes and some bramble supported by menthol as well. On the palate it's ample and fairly direct, with moderate berry fruit supported by some mineral acidity, and by blocky cedar laced tannins that overshadow most everything else. With time the tannins will fold in, but the fruit isn't as bright as I might have hoped. Deep pigeon blood ruby with black reflections. The bouquet is dusky, with moderate fruit and some bramble. On the palate it's ample, with bright sour cherry fruit supported by bright berry fruit acidity and by tannins that are clean nd greenish with some vegetal accents, and flow into a bitter dusky berry fruit finish. Promising, though it needs time. Quite alcoholic. Deep pigeon blood ruby with black reflections and cherry rim. The bouquet is fairly rich, with some berry fruit. On the palate it's sweet, with ripe cherry plum fruit supported by dusky cedary accents and some underbrush, and by tannins that have a peppery splintery burr and flow into a rather bitter finish. It will be a fairly sweet interpretation of Amarone, and may become ethereal with time. Something to look out for. Deep black almandine with black reflections and almandine rim. The nose is a bit rustic, with animal accents and spice mingled with some our berry fruit; there is also the smell one finds around old large wood that is past its prime. On the palate it's fairly direct, with moderate berry fruit supported by mineral acidity and tannins whose aftertaste hearken back to the nose, and also some savory accents. Not as clean as I might have liked. Impenetrable pyrope with black reflections. the bouquet is fairly intense, with candied cherries that bring gummy bears to mind supported by mentholated accents and some spice, and as it opens some cedar as well; with slight cocoa too. On the palate it's ample and fairly tart, with bright sour berry fruit that has some balsamic accents supported by balsam laced acidity and tannins that have a warm spicy burr and flow into a lasting balsamic finish. Pleasant in a fairly traditional key, and if you like the style you will enjoy it, though it needs a couple of years at least to get its bearings. Impenetrable pyrope. The bouquet is unusual, with cut cucumber at first swish supported by slight cedar and some shellac but little fruit; it really doesn't want to be disturbed. On the palate it's ample and fairly sweet, with prune fruit supported by moderate acidity that isn't enough to keep it from settling, and by tannins that are ample and smooth, flowing into a soft prune finish. Lacks verve. Deep black cherry with black reflections. The bouquet is cedar laced with moderate fruit. On the palate it's promising, with fairly ripe cherry fruit supported by bright slightly peppery acidity and by tannins that have a greenish burr and flow into a fairly tannic finish. It's up in the air, but may come together nicely, albeit in a direct up front key. Fairly bright black cherry ruby with purple reflections. The bouquet is moderately intense with candied fruit laced with some mint and airy spice. On the palate it's full, with fairly rich fairly sweet berry fruit supported by peppery accents and tannins that have an angry graphite shaving burr. Quite disjointed. Deep purple ruby with cherry rim. The bouquet is mentholated with some candied accents and underlying berry fruit; it's very young and still rather closed. On the palate it's approachable, with fairly rich, fairly sweet cherry prune fruit supported by tannins that have a distinct greenish burr and flow into a greenish berry fruit finish with considerable spicy splintery tannic underpinning. A lot of oak, which it has yet to digest. When it does it will be approachable in a direct middle of the road key. Deep black cherry ruby with black reflections and cherry rim. The bouquet is moderately intense, with warm berry fruit laced with balsamic accents and some spice, also bright mentholated accents and hints of gummy bear as it opens. On the palate it's direct, with fairly bright berry fruit supported by smooth sweet berry fruit laced acidity, and by tannins that are fairly splintery, and flow into a dusky, splintery finish. Needs another couple of years at least to come together, and will always be fairly oaky, I think, though the brightness of the fruit is pleasant, and will allow the wine to balance the oak -- there is enough. It's just in an unfortunate stage now. Deep pigeon blood ruby with cherry ruby rim. The bouquet is moderately intense and slightly musky, with mentholated notes mingled with cocoa and some peppery spice, also slight berry fruit. Still coming together. On the palate it's ample with moderately intense plum fruit with moderate dusky plum acidity and tannins that have a fairly dry cedar cast to them, and flow into a dry cedar laced finish. I'd have liked more, and brighter fruit; by the time the tannins have smoothed the fruit will I fear have significantly faded. Deep black cherry ruby with black reflections and cherry rim. The bouquet is fairly intense, and quite young, with jammy cherry fruit supported by some India ink bitterness and fairly rich sandalwood spice as well. Pleasant in a very young key. On the palate it's bright, with rich sour cherry fruit supported by bright berry fruit acidity and some dusky bitterness, while the tannins are fresh and rather splintery but bode well for the future. It needs another 3-5 years, but will I think prove interesting. Deep black cherry ruby with black reflections and cherry rim. The bouquet is fairly intense, with greenish cedary accents that have something of wet paper to them, mingled with some scalded milk and greenish overtones, while there's not much fruit. Not as clean as some. On the palate it's ample and fairly direct, with moderately intense berry fruit supported by some acidity, and by tannins that echo the aromas from the nose, flowing into a splintery, blocky finish. Deep black cherry ruby with black reflections. The bouquet is fairly intense, with mentholated cherry fruit supported by nutmeg spice and some plum accents with underlying sandalwood. On the palate it's up front, with fairly bright plum cherry fruit supported by minerality and graphite shaving bitterness, while the tannins are warm and display a youthful splintery burr. Pleasant in a young direct key, and while it doesn't have the depth that many Amaroni have, it does have a cheeky allure. Deep black cherry with black reflections and cherry rim. The bouquet is muted, though swishing brings up some scalded milk, which is from wood, and prune fruit. On the palate it's ample and fairly sweet, with bright splintery cherry plum fruit supported by moderately intense mineral acidity and by tannins that have a dusky graphite shavings burr, and flow into a warm decidedly tannic fiish. Iwi will be fairly rich in a quite ripe key when the tannins fold in. Deep black cherry ruby with cherry rim. The bouquet is rustic, with spice and wet stable straw mingled with penetrating saline accents and some lathered horse. A bit extreme. On the palate it's ample and surprisingly languid, with balsam laced sour plum fruit supported by savory minerality and tannins that are warm and fairly bitter, flowing into a youthfully splintery finish. If you can get past the nose the palate is quite traditional in feel, but you have to like this sort of rusticity or it won't work for you. Deep black cherry ruby with black reflections and cherry rim. The bouquet is smoky, with quite a bit of cedar and some spice, not much fruit. It's hidden. On the palate it's ample and soft with cherry plum fruit supported by smooth not too powerful tannins; I'd have preferred more verve and depth from an Amarone. Deep black cherry ruby with black reflections and cherry rim. The bouquet is fairly intense, with smoky balsamic accents and some wet horse supported by greenish mentholated spice. Not much fruit. On the palate it's ample and fairly bright, with sour berry fruit that's not quite as fleshy as I might have hoped supported by mentholated acidity and some graphite shavings bitterness; the tannins have an angry graphite burr that squeezes the wine down to nothingness making it seem extremely thin, and this was somewhat unexpected from the nose. It needs time. Deep black cherry ruby with black reflections and cherry rim. The bouquet is fairly intense, and rather sweet, with some berry fruit supported by cedar and some scalded milk, with greenish vegetal notes as well. On the palate it's ample, with bright fresh cherry plum fruit supported by deft berry fruit acidity and smooth tannins that have a warm cedary overlay and flow into a clean fresh plum cherry finish with savory tannic underpinning. Pleasant, and promises well, though it is a bit too young to score. Deep black cherry ruby with black reflections. The bouquet is fairly intense, with greenish spicy cherry plum fruit supported by some almost quinine bitterness, and fairly intense graphite shaving minerality. On the palate it's fairly bright, with lively plum cherry fruit supported by fairly bright vegetal acidity and by tannins that have a warm savory splintery burr and flow into a clean bright bitter berry fruit finish. Promising, and will likely be graceful in a couple of years' time. Deep cherry ruby with pink rim. The bouquet is fairly rich, with bright slightly candied cherry fruit that brings gummy bears to mind, supported by deft vegetal acidity and by some dusky bitter undercurrents. On the palate it's ample and fairly sweet, with bright cherry plum fruit supported by bright sour berry fruit acidity with greenish vegetal accents, and by tannins that are fairly smooth, though they do display a certain youthful blockiness. It's full in a rather voluptuous ripe fruit driven key, and if you like the style, which isn't quite sexpot -- the tannins aren't smooth enough now, though they may become so in time, you will enjoy it. Approachable and fairly direct. Deep black cherry ruby with cherry rim. The bouquet is fairly intense, with ripe plum prune fruit supported by jammy accents and spice with some warmth and greenish vegetal accents as well. On the palate it's ripe, with bright sweet plum cherry fruit supported by lively berry fruit acidity and by tannins that have a zesty peppery burr and flow into a warm rather tannic prune plum finish. It's direct, and quite ripe, with quite a bit of alcohol, and tough it is simple for an Amarone it is approachable, and will drink well with hearty stews or roasts. Impenetrable pyrope with purple rim. The bouquet is sweet, with fairly rich greenish plum fruit supported by warm sour plum acidity that has some balsamic accents, and by tannins that are warm and balsamic, flowing into a fairly long peppery balsamic finish. Deep black cherry ruby with black reflections and cherry rim. The bouquet is fairly sweet, with spicy fruit that has some sandalwood notes, and some greenish accents as well. On the palate it's full and sweet, with fairly powerful cherry plum fruit supported by bright berry fruit acidity and by tannins that are fairly smooth, and have bright greenish accents to them. Promising, in a sweeter key that winks at Recioto, and will be pleasant in that key when it's in bottle. If you prefer drier wines it won't work as well for you. Deep black cherry with black reflections and cherry rim. The bouquet is fairly intense, with aromas that bring soap to mind together with some mentholated notes; there are just hints of wet paper as well, which seem to cut into the fruit. On the palate it's ample and smooth, and also fairly direct, with fairly rich cherry plum fruit supported by slight sweetness and dusky spicy accents with a degree of sandalwood and warmth, and by tannins that are ample and fairly smooth, flowing into a clean greenish finish. Simple and very direct, and the nose may just be a phase, because there isn't any evidence of it on the palate. Deep black cherry with black reflections and almandine rim. The bouquet is fairly rich, with sweetish mentholated spice mingled with some berry fruit and some greenish cedary accents. On the palate it's ample and ripe, with cherry plum fruit supported by bright slightly vegetal acidity and by tannins that have a bright greenish burr and flow into a clean bright berry fruit finish. It's approachable, and displays pleasing verve, and will be pleasant in a fairly ripe key. Deep black cherry ruby with black reflections. The bouquet is fairly intense, with powerful greenish spice that has some green leather and leaf tobacco accents, and a fair amount of spice as well. On the palate it's ample, with fairly rich prune plum fruit supported by deft mineral acidity, and by tannins that have a pleasant greenish vegetal burr. Approachable, in a fairly vegetal key. Deep black cherry ruby with black reflections and cherry rim. The bouquet is fairly intense, with floral accents and spice mingled with red berry fruit and powerful tart berry fruit acidity and greenish accents tha bring flower stocks to mind. On the palate it's fairly rich, and quite ripe, with plum cherry fruit supported by vegetal accents and tannins that have a considerable sandalwood burr and flow into a fairly intense sandalwood overlay. It's going in several directions in a ripe key, and is one of the least ready barrel samples tasted, but is also has an intriguing something to it. Deep black almandine with black reflections and cherry rim. The bouquet is dusky, with fairly intense balsamic accents mingled with equally powerful greenish notes and hints of chalk dust; there's not much fruit. On the palate it's approachable, with fairly rich sour plum cherry fruit supported by moderate mineral acidity and by tannins that have a fairly strong greenish sandalwood overlay, and flow into a fairly long sandalwood laced finish. It's pleasant but still disjointed, and needs another couple of years to come together, at which point it will be spicy and rather exotic. Deep black cherry ruby with black reflections and cherry rim. The bouquet is fairly intense, with smoky greenish medicinal accents, and some jammy berry fruit with some balsam as well. On the palate it's ample and fairly rich, with plum cherry fruit supported by fairly bright acidity, and by tannins that have a warm greenish burr and flow into a greenish fairly tart prune finish with lasting sandalwood laced underpinning. Promises nicely. Deep purple ruby with black reflections and cherry rim. The bouquet is moderately intense, with scalded milky accents that are I think derived from oak. On the palate it's ample, and fairly sweet, with ripe plum fruit supported by dusky greenish acidity and by tannins that have a decidedly greenish spicy splintery burr. It's brooding now, and may brood further in bottle though time will tell. Impenetrable pigeon blood ruby with cherry rim. The bouquet is intense, and rather spiky, with a tendril of acidity that worms its way up the nose, supported by brambly accents and a certain airiness. Not much fruit at the outset, though with time prunes and a certain graphite spice emerge. On the palate it's quite ripe, with cherry prune fruit supported by dusky greenish mineral acidity, and by vegetal accents, while the tannins are fairly smooth, with a greenish burr, and flow into a dry rather greenish finish. Pleasant in a quite ripe key, and though very young will be approachable in a year or two. Deep black cherry ruby with cherry ruby rim. The bouquet is fairly intense, and smoky, with some cedar and greenish vegetal accents supported by leaf tobacco and some savory spice. Not much fruit though there is some anger. On the palate it's ample and softer than I expected, with fairly rich, fairly bright fairly sweet cherry plum fruit supported by bright berry fruit acidity and by tannins that are ample and smooth, with slight splintery accents that flow into a warm sweet berry fruit prune finish with dusky leaf tobacco underpinning. It's fairly direct, with a peasant fullness, and the palate is ahead of the nose. If it catches up, the wine will be pleasant in a fairly direct key. Impenetrable pyrope with purple reflections and slightly violet cherry rim. The bouquet is riep, with quite a bit of alcohol and cherry plum fruit supported by greenish sandalwood accents and some spice, and by some white pepper as well. On the palate it's ample and sweet, with plum cherry fruit supported by moderate acidity and by tannins that have a decidedly cedary overlay to them and flow into a dry cedar laced finish. It's quite young, and chewing over considerable oak; how well it will digest it is an open question, but I would have liked more richness of fruit to balance the oak. Deep black cherry ruby with black reflections and cherry rim. The bouquet is fairly intense, with musty wet paper mingled with some greenish notes and moderate acidity; there's not much fruit. On the palate it's quite ripe and quite smooth, with powerful fairly sweet plum fruit supported by sour plum acidity and by tannins that are quite smooth and fairly soft, flowing into a fairly bright cherry plum finish with a dry tannic underpinning. It's young, and will be ample in a very ripe soft fruit driven key. If you like the style you will enjoy it, but if you prefer tighter wines it will work less well for you. The nose is now frankly behind the palate, and if it catches up the wine will be pleasant in its style, but we will have to wait to see what it does. Deep pyrope with violet reflections and purple in the rim. The bouquet is smoky, with burnt cork mingled with spice and some savory accents as well as sweetness. Not much fruit. On the palate it's quite sweet for an Amarone, edging into what one expects of a Recioto, with prune fruit supported by bitter accents and some spicy acidity, and by smooth sweet tannins that again have a bitter underpinning, and flow into a prune laced sweet finish. If you like the style you will enjoy it, but be forewarned: it's a very sweet interpretation of a wine that is usually dry. Impenetrable purple ruby with violet reflections. the bouquet is intense, with floral accents and sweet prune fruit supported by mentholated notes and a fair amount of sandalwood, and also slight laundry soap. On the palate it's ample and fairly sweet, with moderately intense plum fruit that is overshadowed by angry greenish accents and tannins that have a bitter greenish splintery burr and flow into a decidedly bitter finish with graphite shaving splinters. Angry, and it remains to be seen what it does upon its release into the bottle. Deep black cherry ruby with cherry rim. The bouquet is rustic, with powerful balsamic notes overlying wet stable straw and spice; there's also a certain smokiness to it, with some petroleum overtones, though not much fruit. On the palate it's brighter than expected, with fairly rich, moderately sweet plum cherry fruit supported by greenish vegetal acidity and tannins that have a greenish peppery burr and flow into a decidedly tannic rather greenish peppery finish. It's very young, in a ripe key, and needs at least a couple of years to digest the tannins. If the nose catches up with the palate it will be pleasant enough. Deep black cherry ruby with black reflections and cherry rim. The bouquet is intense, and cedar laced with quite a bit of alcohol and considerable sandalwood mingled with some greenish accents and chemical notes. Not much fruit. On the palate it's full, with soft quite riep greenish plum fruit supported by greenish acidity that has some petroleum accents, and by tannins that are warm and smooth, with a slight peppery cedar laced burr that flows into a fairly long petroleum laced vegetal finish with peppery tannic underpinning. It's up in the air, and though I can say it will come down quite ripe, I'm not sure just what the tannins will do. It is in any case fairly extreme, and something to consider only if you like this style. Deep black cherry with black cherry rim. The bouquet is powerful, with spice and slightly burnt cedar mingled with some greenish accents; as it opens the burnt accents fade, and the wine simply becomes closed. On the palate it's fairly direct, with powerful sour cherry fruit supported by spicy accents and tannins that are clumpy and greenish. It's quite behind, and needs at least a year, perhaps two, to get its bearings. Very much a babe in the woods. Impenetrable black cherry ruby with cherry rim. The bouquet is intense, and fairly sweet, with peppery berry fruit supported by some mentholated accents and spice, and also by some sandalwood. Fresh, and fairly charged. On the palate it's bright, with rich cherry fruit supported by some sweetish accents, sour berry fruit acidity, and dusky tannins that flow into a warm slightly balsamic finish. Pleasant in a ripe but not overripe fairly charged key, and will also age nicely for a number of years, though at present it needs time. Deep black cherry ruby with cherry rim. The bouquet is deft, with pleasant mentholated spice mingled with red berry fruit, some berry fruit acidity, and underbrush, while there is also some sea salt. On the palate it's bright, with lively sour cherry fruit supported by dusky acidity that has some tobaccoey vegetal accents mingled with sandalwood, and supported by fresh bright slightly greenish tannins. It's very, very young, but promises well, and should develop nicely with time; it needs a couple of years to work things out and make itself presentable.